TiO2–sulphur composite films have been prepared and employed as photoanode of dye-sensitized solar cell (DSSC). The influence of sulphur precursor content in terms of thiourea concentration on the structural and optical properties of the sample has been investigated. The anatase and sulphur phases exist in the composite. The secondary phases, namely SO3 and Ti3S4, also present in the composite. The 0.3 M sample possesses the highest reflection and absorption in visible region. Raman characterization reveals that the peak at 474 cm−1 corresponds to the A1g symmetric stretching mode of sulphur. The effect of the sulphur precursor concentration on the performance parameters of the device has also been investigated. The DSSC utilizing the sample with 0.3 M thiourea demonstrates the highest power conversion efficiency, η of 1.80% due to the highest dye loading, the lowest bulk and charge transfer resistance and the longest carrier lifetime. Combining TiO2 with sulphur in composite form was found as an effective way of enhancing the efficiency of the DSSC. Photoanode in dye-sensitized solar cell (DSSC) serves as a medium for light absorption mainly in visible region and transfers the generated charge carriers to transparent conducting oxide (TCO). Several approaches have been attempted to tune the properties of TiO2 such as doping with other elemental ions, development of nanocomposites and synthesis of new nanostructures to enhance the performance of DSSC . Improving the optical and electrical properties leads to the enhancement of the performance parameters of the device such as photocurrent and power conversion efficiency. The modifications include coating TiO2 films with other metal oxide films such as ZnO , SnO2  and ZrO2 [4, 5]. TiO2 was also prepared in the form of composite structure with another metal oxide such as TiO2–ZnO , TiO2–SnO2  and TiO2–SiO2 . It can also be prepared in the form of core–shell structure such as SnO2/TiO2 and TiO2/ZnO, respectively [9, 10]. Zinc-doped TiO2 has been employed as photoanode of DSSC and demonstrated the efficiency of 1.34% . Germanium-doped TiO2 has been utilized in the device in order to enhance electron transfer and power conversion efficiency . TiO2–diamond nanocomposite has been utilized as photoanode of the device . The short-circuit current density and efficiency were found to be improved significantly via these photoanode modifications. This work is concerned with the modification of TiO2 by combining it with sulphur in composite form. The new idea of this work is the use of TiO2–sulphur composite as a photoanode of the DSSC. So far, there has been no report on the use of TiO2–non-metal films composite as photoanode of the device. 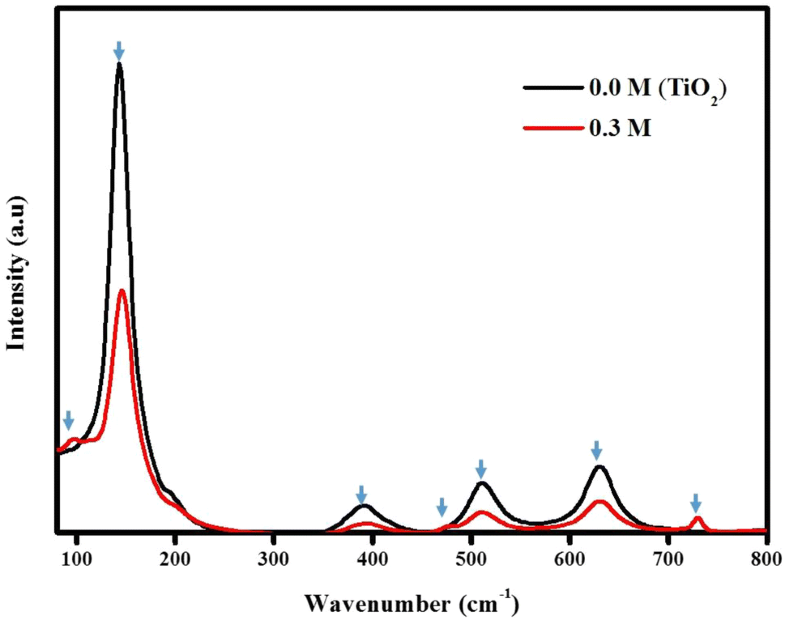 The goal of this work is to investigate the influence of thiourea concentration on the structural and optical properties of TiO2–sulphur composite. The second goal is to study the effect of the sulphur precursor concentration on the performance parameter of the device especially photocurrent and power conversion efficiency. TiO2 films were grown on indium tin oxide (ITO) substrate by liquid-phase deposition method. Firstly, ITO substrate purchased from Kaivo China with a sheet resistance of 16 Ω/square was cleaned in an ultrasonic bath using acetone and 2-propanol in a right sequence. Next, the cleaned ITO was immersed into a growth solution consisting of 7 mL of (NH4)2TiF6 (Sigma-Aldrich) and H3BO3 (Sigma-Aldrich) with the molarity of 1.0 M and 2.0 M, respectively, for 15 h. The TiO2 film was annealed at 400 °C for 1 h in air. The as-prepared TiO2 sample was then spin-coated with 0.10 M thiourea (CH4N2S). This step was repeated with 0.30, 0.5, 1.0 and 2.0 M thiourea. The source of sulphur was thiourea which was purchased from Sigma-Aldrich. The preparation of TiO2–sulphur composite samples was completed by rinsing the sample with adequate amount of deionized water to remove the agglomerated particles on the surface of the sample and underwent annealing process in air at 100 °C for 1 h.
The phase structure of the samples was characterized using X-ray diffraction (XRD) measurements (Bruker D8 Advance system). The optical properties characterization was carried by using UV–Vis spectrophotometer in diffused reflectance mode (DR) (Hitachi U-3900H). In order to obtain more information about the structure of TiO2–sulphur composite, Raman analysis at room temperature has been carried out. 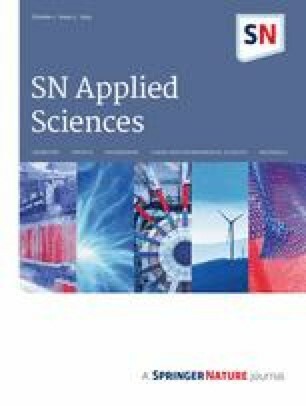 All TiO2–sulphur composite samples were sensitized with N719 dye by immersing the samples in a solution containing N719 dye (Solaronix) dissolved in ethanol at temperature of 60 °C for 5 h. The dye loading of the samples was determined by measuring the absorption of the TiO2–sulphur and TiO2–sulphur-coated N719 dye at wavelength peak of 530 nm. The absorption of N719 dye in ethanol with the concentration of 0.02–0.25 mM was firstly measured also at the peak wavelength of 530 nm. Then, the difference in the absorption of the TiO2–sulphur and TiO2–sulphur-coated N719 dye was then matched with the absorption of N719 dye in order to get the dye loading of the samples. Platinum film with thickness of 20 mm sputtered on the ITO substrate serves as a counter electrode. A DSSC was fabricated by sandwiching a surlyn film between TiO2–sulphur composite and platinum counter electrode and clamped in order to optimize the interfacial contact between the TiO2–sulphur/dye/electrolyte and electrolyte/platinum. The Z-50 electrolyte from solaronix was injected into the space between TiO2–sulphur/dye and platinum via a capillary action. The surlyn film serves as a separator and electrolyte container. 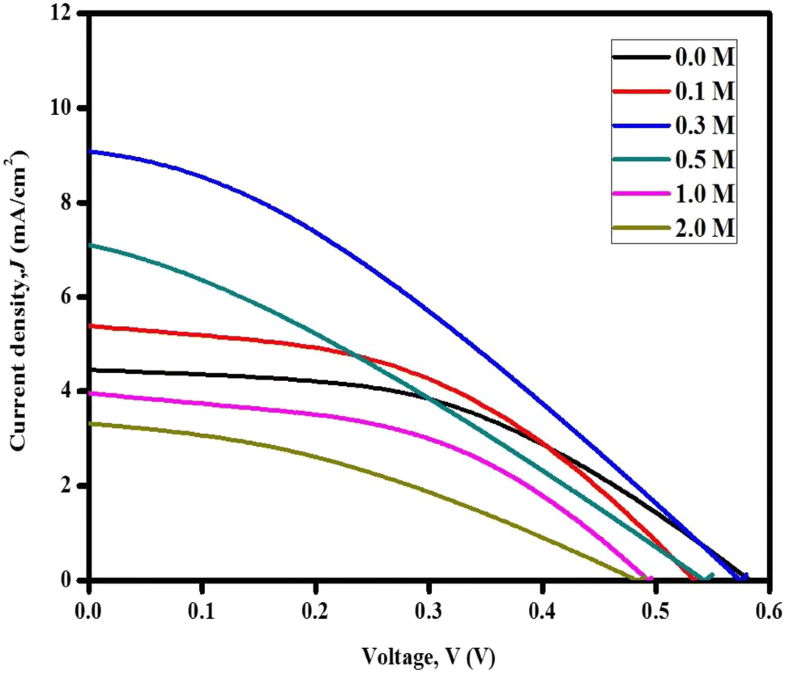 The performance study of the device utilizing the TiO2–sulphur composite with various thiourea concentrations was carried out by observing the current density–voltage under illumination using an AM 1.5 simulated light with an intensity of 100 mW cm−2. The active area of the device was 0.23 cm2. The current–voltage curves and impedance spectra under illumination were recorded by a Gamry measurement system interfaced with a personal computer. The XRD patterns for bare TiO2 and all TiO2–sulphur composite samples are shown in Fig. 1. 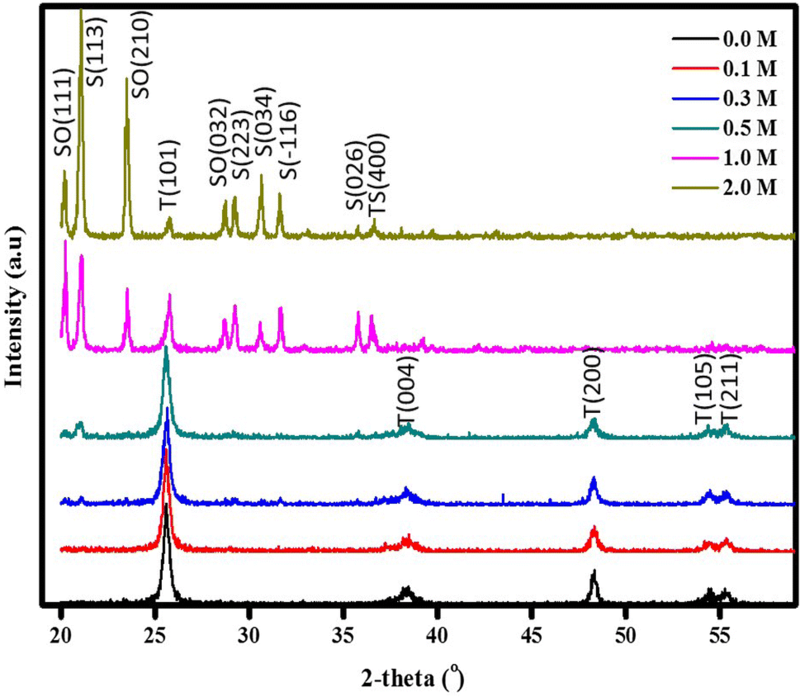 For bare TiO2 film (0.0 M), its XRD spectrum shows an anatase phase with tetragonal structure and lattice plane orientations, (101), (004), (200), (105) and (211) which corresponds with the diffraction angle, 2θ = 25.56°, 38.27°, 48.29°, 54.42° and 55.34°, respectively. All lattice planes of anatase denoted by T notation are in good agreement with the standard spectrum of the JCPDS File (No: 01-075-1537). The highest diffraction peak of anatase is at the plane (101) which proves that TiO2 tends to grow along (101) direction from the ITO surface. The intensity of (101) peak is observed to be decreased upon the addition of sulphur into TiO2. This signifies that sulphur is well dispersed on TiO2 with the increase in thiourea molarity, making the TiO2 phase less detected by XRD [14, 15]. The phase of sulphur denoted by S is observed at the diffraction angles, 2θ = 23.49°, 29.24°, 36.61° and 35.74°, corresponding with the plane (113) (223) (− 116) and (026), respectively. The intensity of these peaks obviously increases with the concentration of thiourea. All patterns of sulphur can be indexed to a material having a monoclinic structure, which is in good agreement with the one listed in the standard data file (JCPDS No. 01-078-0793). The anatase and sulphur phases exist in all samples as illustrated in the XRD patterns. Other detected phases belonging to transition complex compound of titanium–sulphur system are SO3 and Ti3S4. The complex compound phase is also called secondary phase. In Fig. 1, SO3 and Ti3S4 phases are denoted by SO and TS, respectively. SO3 phase exists at the diffraction angle of 20.23°, 24.13° and 28.63°, and Ti3S4 phase presents at the diffraction angle of 36.5°. These two phases are obviously detected in the samples with higher concentrations, namely 1.0 and 2.0 M. The phase of SO3 and Ti3S4 agrees well with the XRD data according to the JCPDS File No. 01-072-0081. These phases might exist due to low annealing temperature used in this work . From Table 1, it is observed that the crystallite size of anatase varies with thiourea concentration with the 2.0 M sample possessing the biggest crystallite size. The 0.5 M sample has the smallest crystallite size. Also, according to the table, the difference in anatase crystallite size between the 0.3 and 0.5 M samples is small that is just 0.3 nm. It can be said that the crystallite size of these samples is similar. However, for sulphur phase, its crystallite size was found to increase with the concentration of thiourea for which the 2.0 M sample exhibits the largest crystallite size. Also, the sulphur crystallite size for the 0.1 and 0.3 M samples is about the same since the difference in the crystallite size is only 0.2 nm. Figure 2a illustrates the diffused reflection spectra (DRS) for all samples. 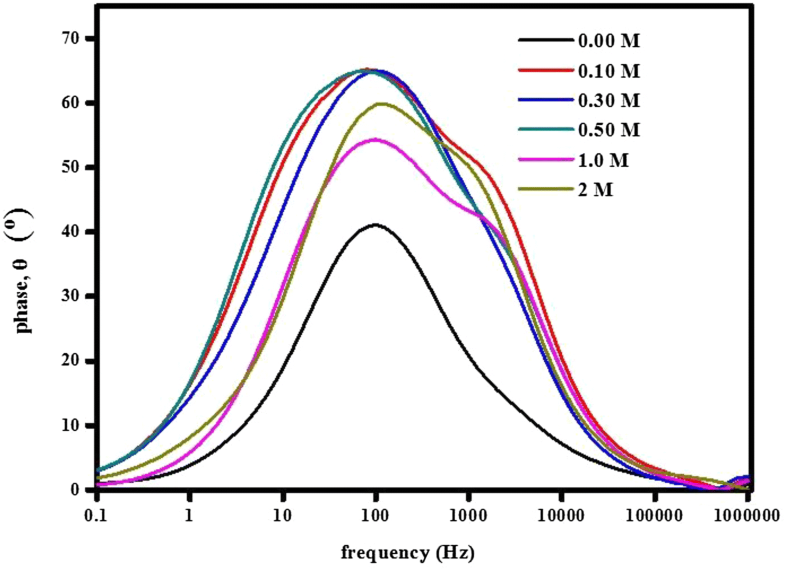 The sample with 0.3 M CH4N2S possesses the highest diffused reflection (80%) in the wavelength range of 500–550 nm which is in the visible region. This indicates that this sample has the best scattering light ability in the visible region. In the infrared region, the samples with the concentration of 0.1 and 0.3 M have the highest scattering property. Good scattering property implies that this sample has high light harvesting efficiency upon incorporation with sensitizer, thus resulting in higher power conversion efficiency when applied in DSSC . The 2.0 M sample has the lowest reflection in the visible region (63%). In other words, the DSSC utilizing the 0.3 M sample has the highest light harvesting efficiency and is expected to demonstrate the highest photocurrent and power conversion efficiency. The absorption spectra of the samples coated with N719 dye are presented in Fig. 2b. According to the spectra, the N719 dye greatly improves the absorption in the visible region, ranging from 400 to 700 nm. All samples coated with N719 possess dominant absorption peak at 530 nm while the sample without dye depicts no peak at that wavelength. 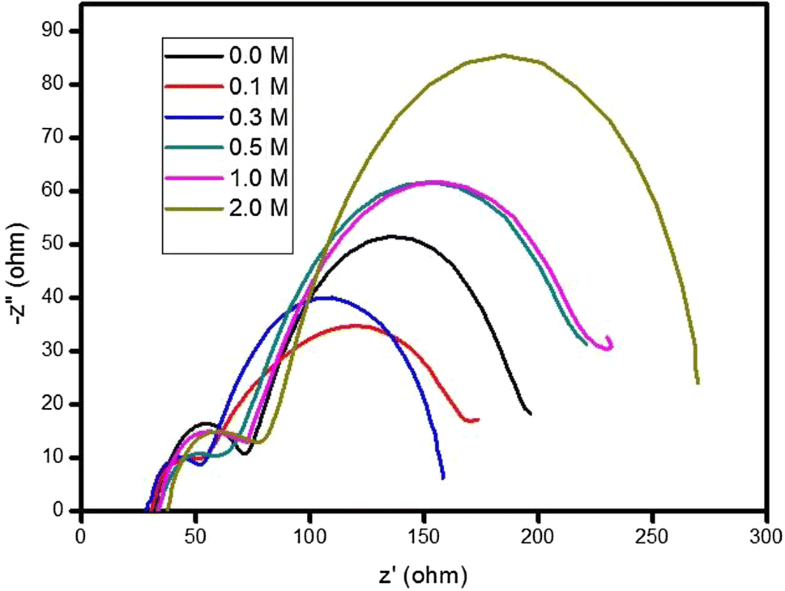 From the absorption spectra, it can be concluded that TiO2–sulphur composite film with the concentration 0.1 M and 0.3 M shows the higher absorption peak compared to bare TiO2 film (0.0 M). The highest absorption peak is owned by TiO2–sulphur composite film with the concentration 0.3 M corresponding with the dye loading of 8.69 × 10−8 mol cm−2 (Table 2) while the lowest absorption peak is owned by the TiO2–sulphur composite film with the concentration 2.0 M with the dye loading of 5.30 × 10−8 mol cm−2. Figure 3 displays the Raman spectrum of TiO2 and TiO2–sulphur nanocomposite (0.3 M) excited with a 514.5 nm beam of the Ar+ laser. Group theory predicts that the typical anatase TiO2 has six Raman active modes: I− = A1g + 2B1g + 3Eg. For TiO2, the Raman spectra present four bands at 144 cm−1 (Eg), 390 cm−1 (B1g), 507 cm−1 (A1g) and 628 cm−1 (Eg). All samples that exhibit the characteristic Raman active modes of the anatase TiO2 phase are in good agreement with the phase structure determined by XRD . For TiO2–sulphur composite with sulphur precursor concentration of 0.3 M, a small peak at 474 cm−1 corresponds to the A1g symmetric stretching mode of S [19, 20]. Other bands that present in the spectra might be from the complex compound of TiO2–sulphur composite system. Figure 4 depicts the J–V curves of the DSSC employing the samples with various thiourea concentrations. It is found that the area under curves representing the output power generated by the device varies with the concentration of thiourea. The 0.3 M device generates the highest output power, while the 2.0 M device produces the lowest output power. It is also noticeable that the slope of each curve is quite high, signifying the high internal resistance in the devices. The photovoltaic parameters are extracted from the curves and presented in Table 2. According to the table, the Jsc and η increase with thiourea concentration until the optimum concentration of 0.3 M and then drops. The 0.3 M device performs the highest Jsc and η which is due to the highest dye loading, the lowest Rb and Rct and the longest carrier lifetime. Also from the table, it is observed that the η increases with dye loading. The higher dye loading results in the higher η. The 2.0 M device demonstrates the lowest Jsc and η. It is also noticeable that the device utilizing the pure TiO2 photoanode performs higher Jsc than that of 1.0 and 2.0 M devices. The SO3 and Ti3S4 phases lower down the efficiency since according to Table 1; the η of the device utilizing 1.0 and 2.0 M samples is smaller than that of the devices with lower concentrations of thiourea. These two phases exist in the samples with 1.0 and 2.0 M thiourea as observed in the XRD patterns illustrated in Fig. 1. The device utilizing pure TiO2 also demonstrates higher η than the 0.5, 1.0 and 2.0 M devices. Also, it is observed from the table that the efficiency of the device without sulphur (1.20%) has been improved quite significantly upon combining it with sulphur in composite form. The efficiency has been improved by 50% by modifying TiO2 films photoanode via sulphur treatment. The highest efficiency of 1.80% was found to be higher than that reported in , yielding the efficiency of 0.18% only. This indicates that the highest efficiency obtained from this work is ten times than reported in this literature. Also, it is higher than that of the DSSC utilizing Zn-doped TiO2 photoanode for which the efficiency was 1.34% . However, it is lower than that of the device utilizing P25 TiO2 photoanode that was 6.50% . From the table, the FF is low since the internal resistance of the devices is high leading high power loss. The Voc presented in the table is also low. Low FF and Voc lead to low efficiency of the device. Figure 5 shows the Nyquist plots of the devices utilizing the photoanodes with various thiourea concentrations. The plots display two semicircles for which a smaller semicircle represents bulk resistance and a bigger one denotes charge transfer resistance. From the plots, it is found that the 0.3 M device shows the smallest semicircles; meanwhile, the biggest semicircles belong to the 2.0 M device. Both resistances are illustrated in Table 3. Figure 6 depicts the Bode plots for all devices. The plots are symmetry about a resonant frequency which was used to compute the carrier lifetime. The 0.3 M device has the smallest frequency leading to the highest lifetime, while the 2.0 M device has the biggest frequency resulting in the shortest lifetime. The improved lifetime of carriers might be due to this reason. The composite sample should be subjected to annealing treatment at high temperature to remove all the organics residues and complexes in order to make sure that the samples are pure TiO2–sulphur without the existence of any secondary phase. According to Table 3, the 1.0 and 2.0 samples have shorter carrier lifetime compared with the samples prepared using lower concentrations of thiourea. TiO2–sulphur composite films have been prepared via liquid-phase deposition assisted with spin coating technique and employed as photoanode in DSSC. Apart from anatase and sulphur phases, the secondary phase of SO3 and Ti3S4 also exists in the sample. The 0.3 M sample shows the highest reflection and absorption in visible region. The peak intensity at 460 nm decreases with thiourea concentration. The Raman peak at 474 cm−1 corresponds to the A1g symmetric stretching mode of sulphur. The efficiency has been improved by 50% by modifying TiO2 films photoanode with sulphur in composite form. The DSSC utilizing this composite demonstrates the highest power conversion efficiency, η of 1.80% due to the highest dye loading, the lowest bulk and charge transfer resistance and the longest carrier lifetime. This study was funded by a research Grant GUP-2016-013.